Is there anything more beautiful than a new car, perfectly detailed to look its best? If you’re an automotive aficionado like me, the answer is no! But a beautiful car only looks that good when it is brand new, right? It definitely takes some elbow grease but when you know what you are doing and have the right tools, your car can look as good as new (or better!) no matter how old the car is. It’s perhaps surprising but the way the tires look goes a long way towards making the car look its best. I’ve done a deep dive into the best tire shine products to find which ones really work. There’s nothing worse than getting your tires looking great, clean and shiny, and then immediately having them full of dirt and grime. This happens with a lot of tire shine products, but the TriNova spray is known for repelling this dirt and grime. It also protects you from the elements and prevents any water spots or stains from salt during the winter time. This not only helps to keep your tires looking great but it can prevent long-term damage. Another advantage of this spray is that you have control over how much shine you get. If you want a high level of shine, just leave it on the tires for a longer period of time before wiping it off. Similarly, if you want low shine, just wipe it off sooner. Verdict: The TriNova Tire Shine spray is a favorite among auto enthusiasts because it offers a great value, is easy to use, and gets the job done really well. If you like your tires to look wet, the Meguiar Insane Shine is a good choice for you. This will really get you that deep, dark, slick, wet look. To get that almost mirror-like shine, this aerosol spray uses synthetic polymers, resin technology, and special antiozonants. In addition to getting that “insane” slick look, your tires will also be protected from premature aging. The Meguiar Insane Shine spray is also the best tire shine if you’re looking for super easy application. As they say, “Just spray and walk away!” It really is that easy. There is no need for rubbing it in or wiping it down. One big disadvantage of this product is that it just doesn’t last all that long. The tires will still look good but that really wet look will only last a few days, maybe a week at most. Verdict: It’s hard to find a tire shine product that is as easy to use, as affordable, and gets as much slickness and shine as the Meguiar Insane Shine spray. This doesn’t give quite as slick of a wet look as the Meguiar Insane Shine, but it comes pretty darn close. You’ll get a wet, glossy, black tire with this spray. The formula of polymers and high-molecular-weight silicones is specially formulated to result in both a high degree of shine and a long-lasting effect. In fact, your tires will stay looking glossy for up to a month. This is another long lasting tire shine product with a really simple application. All you have to do is spray and let it dry. There is no need to rub it in or wipe it down. It also dries really quickly. You have a few options for how glossy you want the tires to be. For a lower level of gloss, you should apply the product to a rag or sponge or applicator and then apply that to the tires. For a glossier finish, you should spray it directly on the tire sidewalls. You also can’t ignore the price of this product. It’s downright cheap for a full 23-ounce bottle. The combination of the low price and the highly effective results are what makes this one of the most well-reviewed tire shine products out there. Verdict: The Black Magic Tire Wet spray is incredibly affordable, incredibly easy to use, and incredibly effective. In short, it’s incredible! This is a thicker version of the Black Magic BM23 spray. This thickness helps it really cling to the tires, preventing any sling. Like with the other Black Magic spray, it relies on a formula of polymers and high-molecular-weight silicones to get that nice glossy shine you’re looking for. It’s also a residue-free shine. With some other thick sprays, you might see a powdery residue but you won’t get that with this spray. It’s another easy to use product with some control over the degree of shine. For a wet-looking gloss, just spray and wait for it to dry. For less shine, apply some to a sponge or applicator and apply to the tire. It dries pretty quickly. This is a long-lasting product that is weather-resistant and rinse-resistant. This means you won’t have to apply every few days or weekly. It’s also quite affordable, though the bottle does contain only 14.5 ounces. The scent is another thing that makes this product stand out. It has a cherry scent that some might find pleasant but others could find off-putting. Verdict: The Black Magic Spray Version offers great adhesion and good protection. It all really comes down to the scent as to whether or not an individual will like this product. 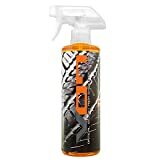 Hundreds of Amazon reviewers have given this brand’s tire shines spray a 4.6-star average and for good reason. The formula for this spray includes nano-polymer additives that extend the longevity of the shine. It features UV-protectant shield that will help extend the life of your tires. This comes in a 1-gallon refill size, offering you a lot of value. The spray is easy-to-use and is dry to the touch almost instantly. You have quite a bit of flexibility in how much shine you want on the tire. You can go from a nice matte, dark black to a deep, wet, glossy shine. Versatility is another plus. You can use it on your wheel wells or to restore trim on any type of faded rubber, vinyl or plastic. This USA-made product is non-toxic and environmentally friendly. It even comes with a 100% money back satisfaction guarantee. There’s really no risk for trying this product, but chances are good that you will be very satisfied. Verdict: The CarGuys know cars and this tire shine is a product for the automobile aficionado. You get long-lasting shine and versatility from a product that is environmentally friendly and you can’t beat that. This is a more expensive product and it comes in a relatively small bottle. This is a premium tire shine product for the best car look, with an oil-based formula along with signature Hybrid V7 optical select gloss enhancers and UV blockers. It can refresh the look of faded plastic mirrors, bumper parts, grilles, and grates, making them look new again. It penetrates deep, resulting in long-lasting black shine results. The Chemical Guys spray is best applied to your tires via a sponge or applicator. It will leave your tires with that deep black, almost wet look. It finishes dry to the touch but it’s important that you wipe away any excess to avoid any dripping, running, or the dreaded tire sling. Verdict: Although it’s a bit pricier, the Chemical Guys Optical Select Tire Shine spray has the potential to be a great product. It provides great protection for the tire and gives you a nice shiny black look. Gel tire shine products tend to last longer than sprays and the Armor All Extreme Shine Gel is no exception. The shine should last for at least a few weeks and it might last even longer. The formula for this gel is fortified with high molecular-weight silicone which is why it has the longevity that it does. This gel product comes with a special applicator, making it easy to use. The applicator helps to ensure that you apply it evenly. Applying it this way means you won’t have to worry about any messy overspray. You won’t be able to get that really glossy, wet look with this gel. You will, however, be able to get a really rich black, in more of a matte finish. In addition to giving you that rich, black look, it also offers protection from the elements. This helps to extend the life of the tires by preventing cracking or fading. Armor All is a leader in the automotive space and they back up what they offer. This tire shine gel offers a 100% satisfaction guaranteed or your money back policy. Unlike most tire shine gels, it’s also incredibly affordable. Verdict: Even though you won’t be able to get a high gloss shine, the Armor All Extreme Shine Gel is worth considering because of its ease of use, protective capabilities, and long-lasting effect. Some people just don’t want their tires to look wet. If you don’t want a high-gloss shine, the Aerocosmetic Tire Dressing might be what you’re looking for. You’ll get a nice dark black satin/matte look instead of that glass-like glossiness. In addition to giving you a rich matte black finish, this is an aircraft-grade rubber treatment and conditioner. It will help to restore and protect both rubber and plastic so you can use it for more than just your tires. This spray is not oily so you won’t have to worry about it being a magnet for dust and grime. Verdict: The Aerocosmetic Tire Dressing is an aircraft-grade product designed for use on Boeing and similar planes but it has a lot to offer for the automobile owner as well. One thing that makes it really stand out is that it is designed for a matte finish, unlike the majority of tire shine products. Just like the Aerocosmetic product, this tire shine spray knows exactly what it is and advertises as such. The Meguiar Hot Shine aerosol spray is high gloss all the way. If you want your tires to be like glass or a mirror, Meguiar is ready to help. The formula includes water-resistant polymers, enhanced resin technology, premium silicones, and antiozonants. This is another one of those tire shine sprays that require almost no effort. You just spray and walk away. It goes on smoothly and levels evenly and quickly to prevent any streaking. The formula then bonds with the tire so your high gloss shine will last for weeks. Verdict: This isn’t the best tire shine product on the market and isn’t even the best one that Meguiar makes but it does get the job done quite well. If you want a high gloss look and prefer an affordable aerosol spray, this one is worth considering. If you’re the kind of auto enthusiast who goes through tire shine products quickly, it’s worth investing in a larger quantity. The Silk Shine sprayable tire dressing from Chemical Guys comes in small sizes of four or sixteen ounces, but the 1-gallon unit offers a better value if you use a lot of tire shine. This is an updated version of their previous Silk Shine product, the Weather-Tek formula and it’s five times more durable than the original. Your tires will continue to look great for weeks. In addition to making the tires look good, they are being protected from the elements. The water-resistant formula means that rain, snow, or other moisture won’t take away the shiny finish. It’s also UV-resistant so sitting in the sun won’t be a problem. This spray is versatile. Beyond just tires, you can use it on interior and exterior rubber, vinyl, black plastics, dashboard and even leather surfaces. It has a “Car Scent” so it will have your car both looking and smelling new. 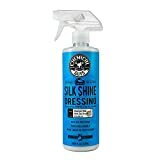 Verdict: The Chemical Guys Silk Shine Sprayable might not be the perfect tire shine product for everybody but it’s definitely the right option for some people. You get a good value with the 1-gallon size and it offers versatility, protection from the elements, and a decent shine. Can I make Homemade Tire Shine? There are a few alternatives to using Tire Shine. You can actually use Pledge furniture polish, as YouTube user Ryan Mayer describes. You can also make DIY Tire Shine using dish soap, alcohol, and Castor oil. If you like DIY projects, it's worth trying. If you'd rather do the least amount of work, it makes sense to purchase the premade product that you know you can count on. What is the best way to use sprays or foam? The best way to apply sprays or foam tire shine products to your tires is indirect. Instead of applying the product directly to the tires, you should put some on a rag and then work it into the tire that way. A special applicator, like the Chemical Guys Durafoam Contoured applicator, is an even better way to use tire shine sprays or foam. This helps you apply the product evenly without risk of dripping and it also results in less product waste. Can you use it in the car's interior? Yes, you can use tire shine on some interior locations. Especially if your dashboard is black, it should work well to clean it off and give it a nice shine. It's perfectly safe to use on vinyl and rubber trim. Just be careful not to use too much of it. Less is more in the interior locations. Can I also spray my rims? You can, but it's not really a great idea. Brake dust will stick to rims that have a tire shine product on them and this can be a big mess. Tire shine can also potentially damage the rims. Instead of tire shine, some kind of auto wax is the best thing to use on your rims. This will give you a nice shine while preventing brake dust from sticking. I heard that you can use olive oil as well. Is it best? Yes, you may find success using olive oil as a tire shine product. The oil can nourish the rubber without drying it out. It will also result in a nice glossy shine. It is also pretty cheap and environmentally friendly.That said, olive oil tends to be somewhat sticky and attracts dirt and debris. This means that your tires may get extra dirty after use. Is it okay to use tire shine on a motorcycle? When you want your bike to look its best, it seems like common sense that a tire shine product should be part of that process. However, using tire shine on a motorcycle has the potential to be very dangerous. It can potentially make your tires slippery which can lead to dangerous sliding and crashes. The only safe way to use tire shine on your motorcycle tires is to spray some on a rag and apply it that way, being careful to avoid the treads. Never spray tire shine on motorcycle tires because it is too easy to get some on the treads. How long does the shining effect last? This varies quite a bit based on how much use the tires get, where you store your vehicle when it's not in use, and the type of tire shine you use. Typically, you can expect your tires to continue looking great for a few weeks. If you drive the vehicle a lot and leave it parked in the sun all day, the tires may only look great for a few days. If you don't drive it all that often and keep it parked in a covered structure, the tires might stay shining for up to six months. Which brand do car dealers use? This varies from dealer to dealer. Most dealers have their favorites. They are looking for that great first impression so they will often use a product that leads to a great look but doesn't necessarily last. 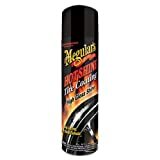 A lot of dealers use Meguiar products, like the Meguiar Insane Shine or the Meguiar Hot Shine. Which one in this list will last the longest? Both of the Black Magic tire shine sprays, the Chemical Guys Silk Shine Sprayable, and the Armor All Extreme Shine Gel all offer long-lasting protection. The TriNova Tireshine spray does last a long time as well but it doesn't hold the full glossiness of the shine for as long. No matter what kind of tire shine product you use, a number of things can affect how long the effect will last. This includes things like parking in the sun and contact with things like rain or snow. Which is best, Gel VS Spray VS Foam? There are advantages and disadvantages to each type of tire shine product. Gel lasts a really long time but it can be hard to apply and it tends to be more expensive. Spray is cheap, easy to use, and cleans the tires really thoroughly but it doesn't last as long and it can stain paint if it's not carefully applied. Foam lasts a long time, doesn't require any scrubbing, and penetrates deep into the tire but it can be messy and the application can be a little tricky. Any one of these does not attract dust? The TriNova Tire Shine spray is really good at repelling dust, dirt, and grime. The Black Magic Spray Version is also quite good at resisting the elements which will prevent it from getting dirty. The Aerocosmetic Tire Dressing is another good option for repelling dust because it is a water-based formula and doesn't use any oil. Each of these ten tire shine products will get the job done. The right one for any given individual will depend on personal preference, like how glossy of a shine they are looking for, how important ease of application is, whether or not scent is important to them, and how much room they have in their budget for automotive accessories and products. Have you used any of these tire shine products? What did you think? Do you have any tips for applying tire shine? Please share in the comments!